Students at the University of Arizona will now be able to obtain a Bachelor of Arts in Arabic, a new degree that solidifies the University's status as having one of the best Arabic programs in the country. Offered by the School of Middle Eastern and North African Studies, or MENAS, the degree will graduate students with proficiency in the Arabic language and knowledge of Arab cultures. In completing the academic program, students will be able to choose from five levels of Arabic courses, a few Arabic dialects and a large selection of courses in English offered by MENAS. In addition to being the language of a civilization that has contributed to science, philosophy and literature, Arabic also is identified as both a "strategic" and a "super critical" language for the United States. Employment opportunities for students proficient in Arabic are diverse, and they include positions in academia, government, international business, law, development and tourism. "We are excited to be able to offer a new B.A. in Arabic," said Benjamin Fortna, director of MENAS, which is housed in the UA's College of Social and Behavioral Sciences. "This new major will draw on the strengths of our widely recognized Arabic program and will attract even more students to learn this rich language, which is so important for the world today." The UA is well-positioned to offer a Bachelor of Arts in Arabic. MENAS offers an undergraduate minor in the language and a Bachelor of Arts in Middle Eastern and North African studies. The school also currently has more than 50 students participating in its Arabic Flagship Program and the Project Global Officer Program, both federally funded by the National Security Education Program, who can benefit from the new major. The UA is one of only five universities in the country selected to participate in the federally funded Arabic Flagship Program, which helps students from all majors reach superior-level fluency in Arabic. All Arabic Flagship Program students are required to spend a capstone study year abroad in an Arabic-speaking country, and they receive partial scholarships for overseas and domestic Arabic study. Last fall, funding for the Arabic Flagship Program was renewed until 2020. Project Global Officer, or Project GO, is an initiative aimed at improving the language competency, regional expertise and intercultural communication skills of ROTC students, including through study abroad. The UA is the only institution in the country funded to offer advanced Arabic language education for ROTC through Project GO-Advanced. Sonia Shiri, director of the Arabic Flagship Program at the UA, said that the pressure to create the major came from students, who were earning extensive course credits in Arabic through the Flagship Program. "This need was quickly recognized by MENAS and the College of Social and Behavioral Sciences, who then supported the creation of the major," she said. Because some of the students interested in the Flagship Program don’t have a language requirement, the large amount of Arabic coursework combined with the required 12 months of study abroad often means a delay in graduation. With the new degree program, students in the Flagship Program — many of whom are in STEM fields — will acquire an extra major in Arabic, which can be helpful in pursuing careers after graduation. ROTC students in Project GO also were interested in the major, which can translate into extra scholarships now as well as improved career opportunities in the future. "Arabic fluency is a highly sought-after skill set in the United States Air Force and the entire Department of Defense," Col. Brian Donahoo, former commander of the ROTC, wrote in the program application. "A certified Arabic language major at the University of Arizona will greatly benefit the University and the Air Force ROTC program by attracting and retaining high-quality students and cadets." Another program that will feed into the new degree in Arabic is the pre-collegiate Arabic Jumpstart Program. Offered by MENAS, with a tuition reduction from the UA and additional funding from the Arabic Flagship Program, the program is an intensive summer Arabic course in which high school juniors and seniors earn college credit. 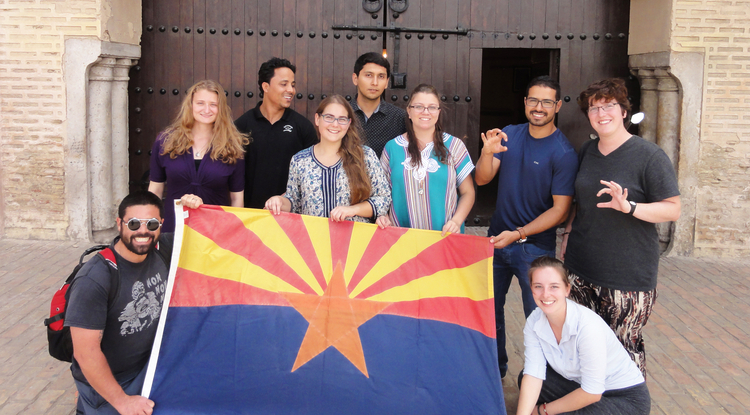 Last summer, 27 students from seven Tucson-area high schools participated in the program alongside UA students. The 2017 Jumpstart Program is open to high school seniors from anywhere in the country as long as they plan to attend the UA in the fall. Shiri anticipates that the new degree program will be of interest to students from across the country, especially those in Western states. The UA will complete the paperwork to have the program be eligible for the WICHE (Western Interstate Commission for Higher Education) Undergraduate Exchange. Through WICHE, students from 15 Western states could earn the degree from the UA with in-state tuition rates, as long as their state does not offer the same major. In the participating states, only two states — California and North Dakota — offer such a program. The availability of the Flagship Program provides an added incentive to come to the UA to study Arabic. The UA also has a federally funded Title VI Center for Middle Eastern Studies, which offers Foreign Language and Area Studies fellowships to study Middle Eastern languages stateside or abroad. "I came to the UA for a variety of reasons, with the strong Arabic program being one of them," said Ryan Brown, a sophomore majoring in pre-business. Brown, who hopes to work for an international company in the Middle East, has now declared Arabic as his second major. "I have always dreamed of one day attaining fluency in Arabic, and the new Arabic major will definitely assist in achieving my goal," he said. The excellence of the UA's Arabic Program recently was confirmed by Roger Allen, a prominent Arabic scholar, who was an external reviewer of the program in 2015. "This is one of the best-conceived and -executed programs of Arabic language instruction that I have encountered during my 46-year career teaching Arabic and its literature in the United States," Allen said.